The Story: The scene takes place at night, in a natural pool near the sea, in snorkeling : following this common fish in Reunion island (it chases the night and hides under corals during the day), I had the chance to see a scene of life, rather unusual: hunting and ingestion of prey. 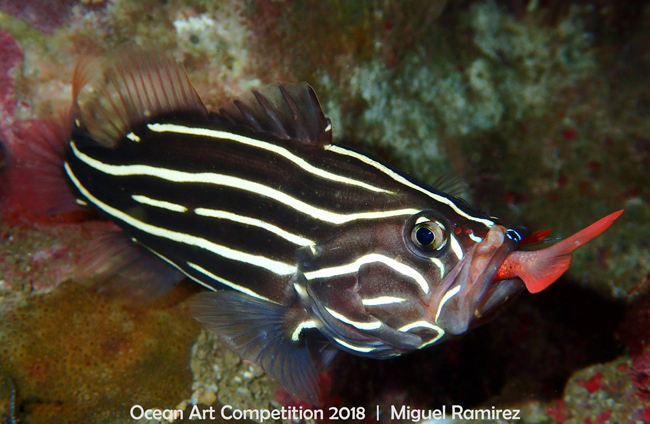 We can guess the big appetite of the soap fish, its prey being barely smaller than it ! Also, we can see his eye that fixes me, as if my presence disturbed him !